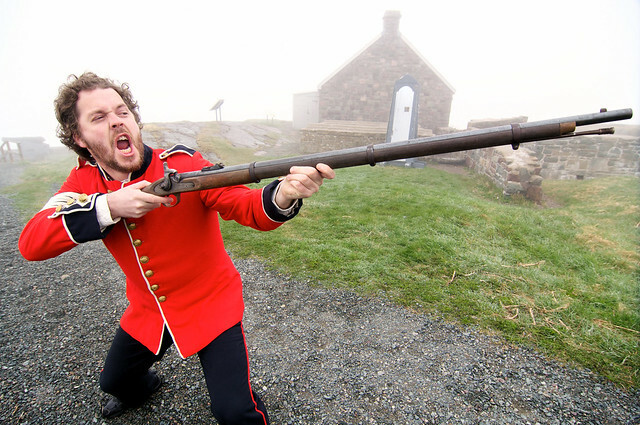 Friday, Sept 16th is our final show for Ghosts of Signal Hill, with Jed Baker closing out the season as Lt. Ranslaer Schuyler. We also have a date with Hurricane Maria, and some of you (including Jed) are worried about what this means to our season finale. Well, have no fear! We'll go ahead rain or shine. If weather is good, we'll march you up the hill to the usual storytelling venue. If weather is bad, we'll move the show into the Parks Canada Theatre at the Signal Hill Visitor Centre, and tell stories from there. The show starts at 8pm. Tickets are $15 at the door ($10 for kids 12 and under). If anything changes, we will post a note here, and on the Ghosts of Signal Hill facebook page. As of right now, we are still going ahead with the show at 8pm tonight. This will be a fully indoor show at the Signal Hill Visitor Centre Theatre, which is safe, warm, and cosy! If you have tickets purchased for tonight, they are non-refundable, so we hope to see you there. We will post again at 5pm. We are in the eye of the hurricane now, and everything is a go for 8pm! See you on the Hill. There are only three more shows left of Ghosts of Signal Hill, concluding Friday, September 16th, 2011. We've been selling out almost every show, so if you want to catch one of the last ones, you are best to get your ticket in advance from the Signal Hill Visitor Centre on Signal Hill Road. It is also now getting a lot darker a lot earlier. There is a walk (in the dark) from the parking lot to the show venue, so if you want to bring along a flashlight to help guide your way up and down, you are invited to do so. We just ask that you shut the light off once you come into the performance space. And yes, I'm still 8 years old at heart, playing in the dark with a flashlight! Hope to see you on Signal Hill soon. PS @thescopeNL is looking for the Best Late Night Walk. Give me some ghoulish love at http://t.co/k5Wx2D4 and suggest the St. John's Haunted Hike! 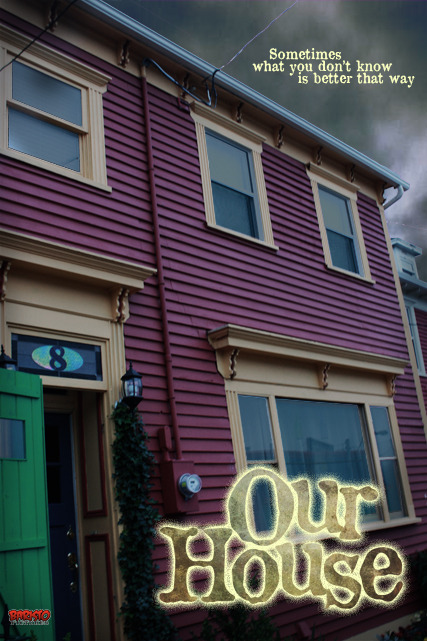 Baristo Pictures is casting a new short horror film called “Our House” that will be shooting in early October as part of NIFCO’s First Time Filmmaker program, and they are looking for volunteer actors. 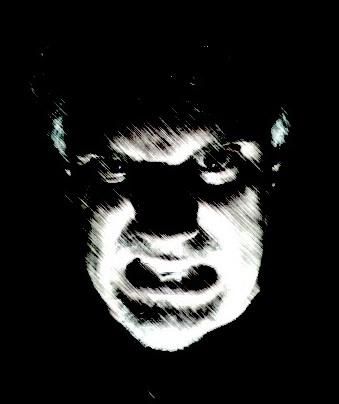 Yours truly, hopefully, will put in a guest appearance, in my St. John's Haunted Hike persona. You can follow Baristo's Mike Hickey on Twitter, or check out the casting call. I'll post more as details come available. This video is a small excerpt from my new show "Ghosts of Signal Hill", being performed every Friday night on Signal Hill, in partnership with Parks Canada. 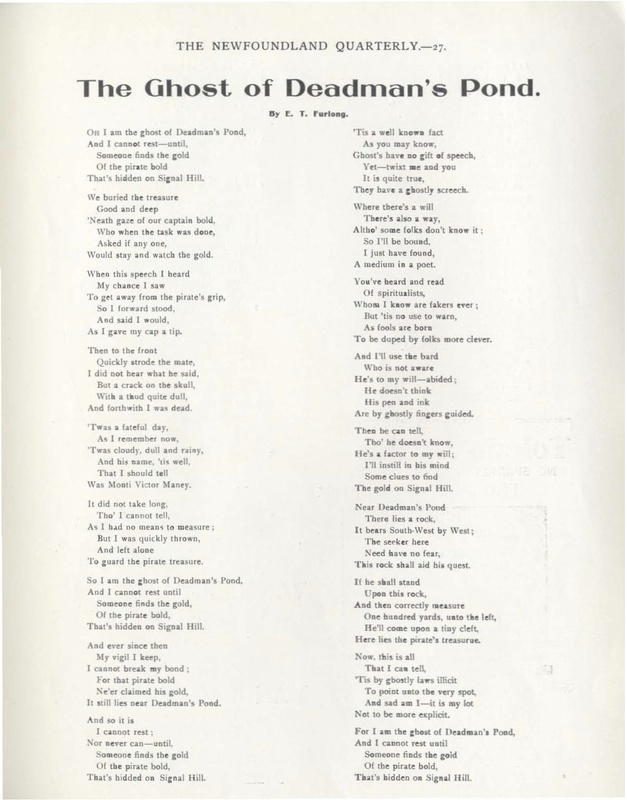 The video shows the performance of a recitation called "The Ghost of Deadman's Pond." The recitation is my own adaptation of a poem written by E.T Furlong in the Newfoundland Quarterly Christmas Edition, December 1939 - Vol. 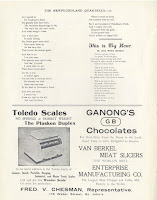 39(3), p. 27. 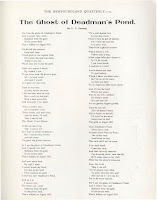 The original poem is quite long; I shortened it for performance. In writing the script for "Ghosts of Signal Hill" I very much wanted to include a recitation as part of the show. Recitations are roughly equivalent to the English tradition of monologues. 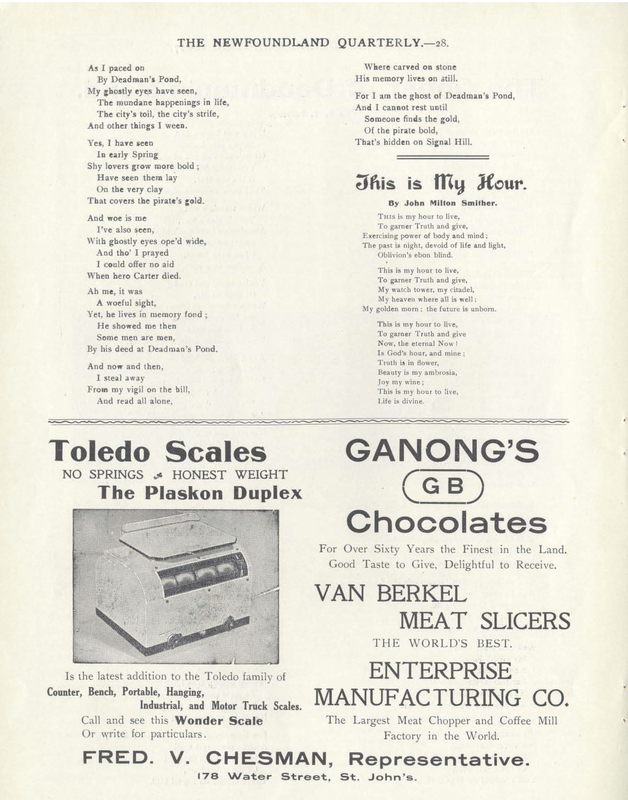 Folklorist Kenneth Goldstein defined them as "a solo, stylized, theatrically mannered oral performance from memory of a self-contained dramatic narrative in poetic or prose form." It is one of those aspects of traditional Newfoundland performance that I love, a tradition which is still living in many communities. 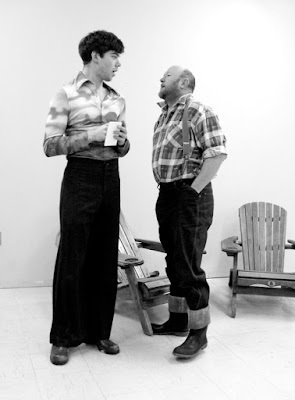 Recitations, while sometimes told in private settings, were, and continue to be in many Newfoundland and Labrador communities, more often part of public performances, concerts and times. In a sense recitations are more highly formalized than oral stories, following a set text prepared in advance, and often, though not necessarily, in rhyming form. Special thanks to Trevor Kearsey, Internet and New Media Officer with the Newfoundland East Field Unit of Parks Canada for filming and editing together this piece! Daring escapes, murdered pirates, ghost ships, buried treasure, tragic drownings, and headless phantoms: it is all in a night’s work at Signal Hill National Historic Site in St. John’s, Newfoundland. Or at least it is for storyteller Dale Jarvis, creator of the award-winning ghost tour, the St. John’s Haunted Hike. 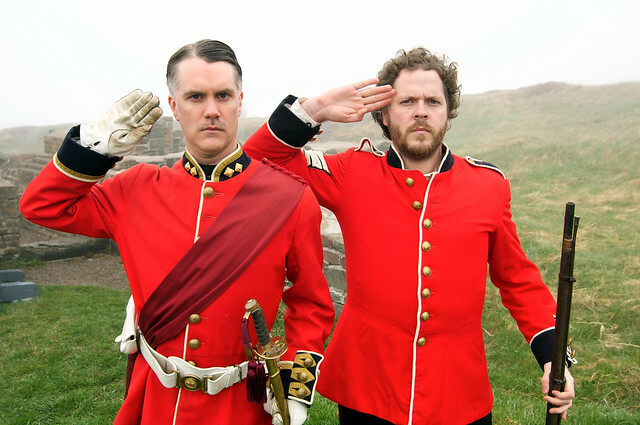 No stranger to strange stories from old St. John’s, Jarvis has created a new storytelling show for Newfoundland’s most historic hill. Ghosts of Signal Hill is Jarvis’s newest work: an evening of ghost stories, historical tales and strange adventures. 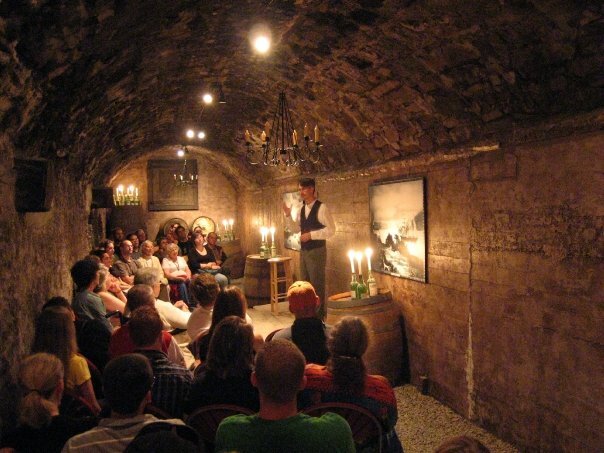 His spooky stories are spun out for eager listeners by lamplight inside the historic Queen’s Battery Barracks, overlooking the Narrows, the entrance to St. John's Harbour. The last North American battle of the Seven Years' War between England and France was fought on the Hill in 1762, after St. John’s had been captured by the French. In September of that year, the British reclaimed the town, marching overland from Torbay. 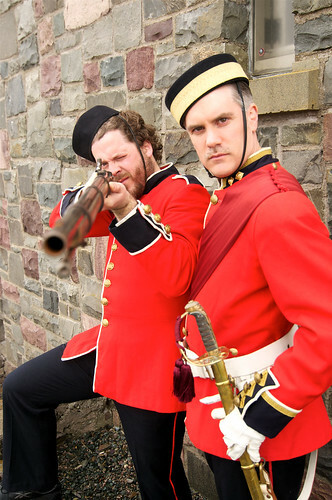 “The 1762 Battle of Signal Hill provides a great backdrop for the show,” says Jarvis. He portrays a real historical character in the piece, a role he shares with local actor Jedediah Baker. Jarvis is passionate about local history and folklore, and believes storytelling is a great way to get people interested in what is often portrayed as a dry and dusty subject. Ghosts of Signal Hill runs every Friday night at 8pm until September 16th. Tickets are $15 ($10 for kids 12 and under) and are cash sale only, available at the Signal Hill National Historic Site Visitor Centre. There is no performance on Canada Day, July 1st. Well, the little photograph of what might (or might not) be a ghost in the historic Newman Wine Vaults in St. John's, Newfoundland is getting a lot of attention: reports on CBC radio and television, VOCM radio, the internet, and as of this morning, apparently, it has made the CNN Morning Express television program! Read the article and see the video here. Got a suggestion? Let me know! The St. John's Haunted Hike turns 14! 1997 was the year of the John Cabot celebrations in Newfoundland. According to legend, heresay, and the provincial tourism department, John Cabot had landed in Bonavista (and definitely NOT Cape Breton) five hundred years before. The Matthew sailed into port, tourists descended, and I started a little summer business called the St. John's Haunted Hike. Fourteen years later, the Hike is still going strong. We've just started up our season, with people already showing up in the cold and drizzle to hear our stories. So, if you are downtown these evenings, you'll likely see myself, or one of my long-time guides Dave Walsh or Steve O'Connell, leading a group of tourists and fans of the paranormal from site to haunted site. The Hike runs every Sunday to Thursday evening at 9:30 pm from the stone steps of the Anglican Cathedral on Church Hill. Tickets are $10, with no need to book in advance. I'm in an airport! It is hardly news to anyone who follows me on twitter that I'm writing from yet another airport, but it is true. I'm in Ottawa, having just finished a speaking engagement last night for Memorial University Alumni. It was a great turnout, with some familiar faces in the crowd, which is always a plus for me. Here is the interview done by Dean Verger at the event. I'm off to Halifax, for another talk and storytelling session tonight at the Elephant and Castle Pub. Last night I was telling ghost stories, Jack tales and some oral history material from Newfoundland. Who knows what tonight will bring, through there will definitely be some ghostly tales, and perhaps the appearance of a sea monster or two. It has been a great mini-tour so far, and I'm delighted that Memorial University, and their sponsors Johnson Insurance and the Elephant & Castle pubs, have been so supportive. It is great to get storytelling out to new audiences, and introduce Newfoundland stories to new (and old) listeners. I went out for breakfast this morning with Ottawa's Ruthanne Edward, who was host of the St. John's Storytelling Festival's first story slam earlier this year. It is always great to get to hang out with fellow storytellers, to talk about what is happening in the storytelling community. We talked about how it is that storytellers so often work in isolation, working individually on personal projects, without a lot of opportunities for some of us to collaborate, critique, grow and converse about our art. I head back to St. John's in the morning, taking every chance I get along the way to run lines for Ghosts of Signal Hill which opens this Friday night at 8pm! Zounds! I've been working on an exciting new ghost story project, and its launch date is coming closer and closer! This summer, as part of the fourteenth season of the St. John's Haunted Hike, I've created a new show, in partnership with Parks Canada and Signal Hill National Historic Site: Ghosts of Signal Hill. Daring escapes, murdered pirates, ghost ships, buried treasure, tragic drownings, and headless phantoms: it is all in a night’s work at Signal Hill National Historic Site. Ghosts of Signal Hill will be an evening of ghost stories, historical tales and strange adventures. 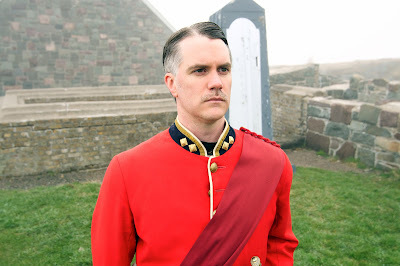 Join the dashing Lieutenant Ranslaer Schuyler by lamplight inside the historic Queen’s Battery, and find out what happens on Newfoundland’s most historic hill, after the lights go out. The show will run every Friday night this summer at 8pm, from June 3rd to September 16th. Tickets will be $15, $10 for kids 12 and under, and price includes admission to Signal Hill National Historic Site Visitor Centre. The role of Lieutenant Schuyler will be played by yours truly, with Jedediah Baker performing the role on alternating nights. Seating is limited. Tickets will be available for advance purchase at the Signal Hill Visitor Centre. Check the website, and I'll let you know when tickets go on sale! And, of course, you can like this on Facebook! UPDATE: here are the promo photos! It sold out its first show, and now the Monsters are back! In the ocean's depths lurk rarely seen horrors. From giant squid and whales the size of a house, to mind-reading mermaids and the most angry sea-horse you'd ever want to meet, the seas off the shores of Newfoundland and Labrador have seen it all! Join storyteller Dale Jarvis of St. John's Haunted Hike fame for tales of creatures from the deep. You may never want to dip your toe in the water again. Tickets just $5 and free for Rooms Members. Earlier this year, I had the great opportunity as a storyteller to take part in the wonderful Alden Biesen International Stortyelling Festival in Belgium. It was a great experience, and wonderful to see so many storytellers working and sharing in so many languages. Since I was in Belgium, I took some time off to explore some of the country's great cities, and I made certain that I visited some of the sites that have entered our consciousness as Canadians, sites with names that resonate with those of us who have never even visited Belgium, names like Passchendale, Flanders, the Ypres Salient. At Ypres, on an appropriately grey day, I walked around the imposing Menin Gate. The gate is a memorial to those soldiers whose bodies were never found, 55,000 of them, which was erected on the spot where the soldiers left the city for the frontline, never to return. Even today, they are still digging the bodies of fallen soldiers out of the Flanders clay. It brought the reality of that conflict home to me in a way that can only be described as emotional; and what struck me most as I walked through the impeccably kept graveyards of Flanders was how young all those soldiers were. I came home from Flanders to a country facing an election. In a world where young people are dying every day to for the right to have a democratic say in their own futures, I think we all too often forget about all those young men and women who died to protect our freedoms. I've already made my vote in advance, as I'll be travelling to Hopedale, Labrador, on election day. If you haven't voted, you should. The democracy that people died for works when we all make it work, together. You can make a difference with your vote.